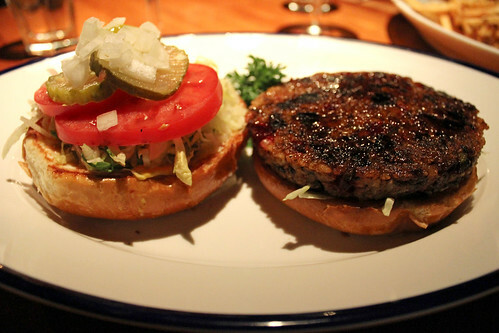 A little history: Hillstone’s veggie burger is the veggie burger that started it all. When I first ate this burger six years ago, my mind was blown. I had never tasted a veggie burger so good before! And it became the standard to which I compared all other veggie burgers. Now knowing just how amazing a veggie burger could be, I started seeking out other amazing ones. A couple years later, I started this blog. 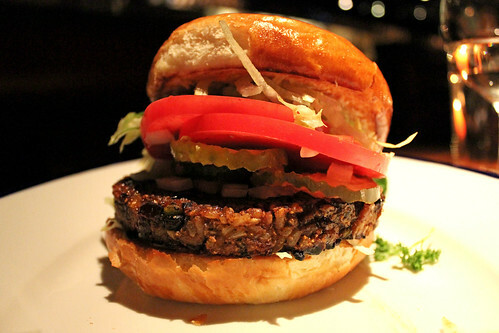 One of the earliest reviews I posted, almost four years ago, was my review of Hillstone’s veggie burger. It was the first five-star review I posted. 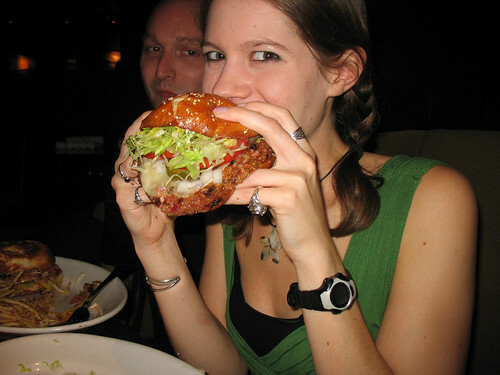 June 2010: Me stuffing my face with Hillstone’s veggie burger. In the years since posting that review, I have heard from a lot of people who also adore this veggie burger as much as I do. 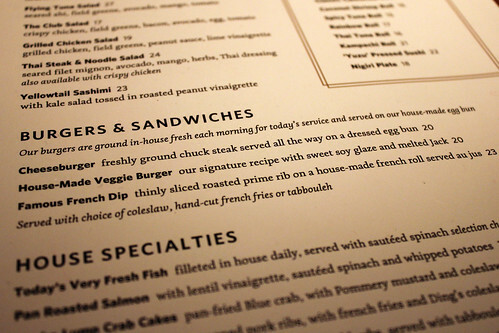 But I also received a few emails from people claiming to know from a source inside the restaurant that the burger is the not really vegetarian: One person said that the glaze used on the patty contained Worcestershire sauce, which typically contains anchovies. I also saw comments on other websites warning that one of the ingredients is fish oil. Devastated to learn that one of my all-time favorite burgers might not be vegetarian, I reached out to Hillstone to see if someone could confirm or deny these rumors. Joel, the general manager of the Midtown Manhattan location, called me to answer my questions over the phone. He assured me that the burger is 100% vegetarian. The patty itself is vegan, and is coated with a sweet soy glaze (no Worcestershire or fish oil ingredients in it). The bun is not vegan, and neither is the cheese or mayo, but the burger can be requested without these elements if you are vegan. Just make sure to ask your waiter. I was thrilled to hear this news – and very impressed that Hillstone cares enough about their vegetarian customers to take the time to answer my inquiry and set the story straight! 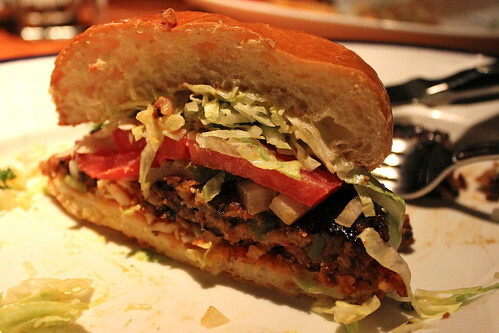 So, excited to go back and eat this delicious veggie burger again, my boyfriend and I went out for a dinner date. I ordered my burger without cheese. I noticed that it came with a choice of fries, coleslaw, or tabbouleh. So I decided to try tabbouleh, for a change! Mmm… When the veggie burger arrived, it looked just as mouth-watering as I had remembered. The patty is made in-house, and it is complete perfection: a mixture of rice, beans, beets, and other ingredients glazed with that (100% vegetarian!) sweet soy glaze. It is savory and sweet at the same time, and simply delicious. Topped with pickles, onion, lettuce… and the juiciest, reddest tomatoes! Plus mayonnaise and mustard. The patty steals the show, but the toppings are tasty too. And the bun is perfect– soft and sweet, just the right size fit the width of the large patty. I compared it to a pastry in my previous review, and I still agree that it is one of the nicest buns I have tried. who said his (100% NOT vegetarian) cheeseburger was exceptionally good as well. 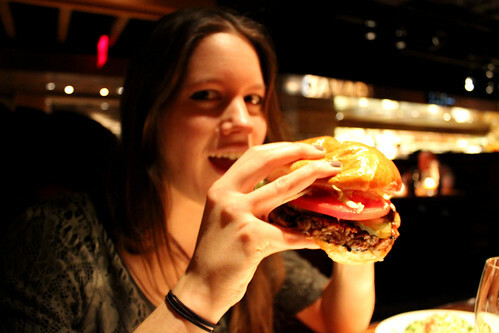 Of course, it’s a bit messy, as many good burgers are – and it started to fall apart in my hands after I took this bite (in case you can't tell from the photos, it is a massive burger!) I used my fork to eat all the leftover bits off my plate after I finished devouring what I held in my hands, because it was so good I did not want to miss a morsel. 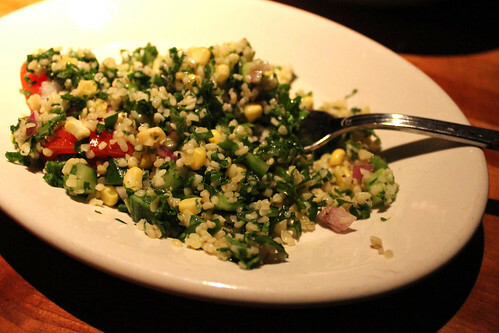 And the tabbouleh was quite good as well! I liked it as a lighter, healthier choice instead of French fries. The burger is plenty filling on its own! This is still one of my top favorite veggie burgers of all time. 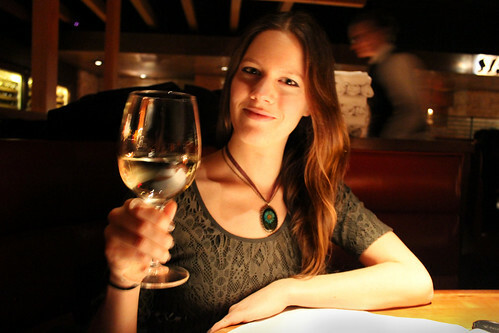 And Hillstone is a great option for a romantic date night if you’re a vegetarian dating an omnivore (or vice-versa) - I wish all restaurants served a vegetarian option as good as this one! 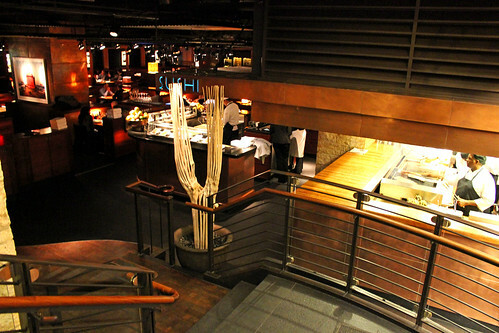 Read my original review of the Park Avenue South location here. I've been drooling over the Hillstone burger ever since you posted your first review. I wish they'd make that darn bun vegan! Kudos for them taking the time and effort to confirm.